This year marks the fiftieth anniversary of Book Awards in New Zealand. Our national prize has had different sponsors and incarnations over the years: it’s now the Ockham NZ Book Awards, held each May on the Tuesday of the Auckland Writers Festival. Over the years many of our brightest and best writers, and classic books, have been recognised in the awards. Many of these authors are part of the Academy of New Zealand Literature. We’re celebrating their work this year by publishing excerpts from one of their award-winning books, along with notes from the authors on writing those books. Here’s to fifty more years of great books and our constellation of writers. 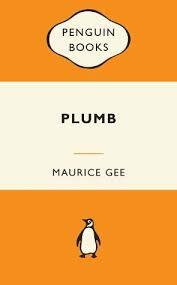 It’s more than forty years since I wrote Plumb and I’m not sure now where some of the things in the book come from. But I am sure about the chapters reproduced here. They describe George Plumb’s trial for seditious utterance during The First World War and they follow closely the trial of my grandfather James Chapple in 1918 on the same charge. Like Plumb James Chapple was a clergyman and, like Plumb, a fierce controversialist in politics and religion. His trial was reported in detail in newspapers at the time, but he received a sentence of eleven months imprisonment not Plumb’s fourteen. (I gave Plumb a bonus.) About 60% of the three chapters is my work and 40% taken from newspapers and my grandfather’s writings. 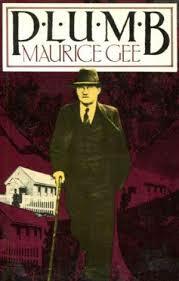 He published books of essays and lectures and two of the lectures had titles used in the novel: ‘Julius Caesar or Jesus Christ’ and The Glorious Bolsheviks of Russia’. I don’t look on this as stealing, or if it is then I’d have to say that lifting things from here and there is legitimate for fiction writers. But we mustn’t pinch from each other, just be ‘influenced’, with perhaps a word or phrase ‘borrowed’ if nothing else will fit. 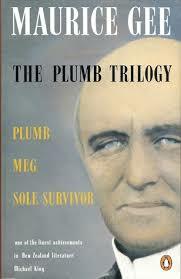 Plumb’s trial is one of the key events in the novel. Others have their source in James Chapple’s religious, political and family life, all dramatised within the life of the book. The chapters presented here show Plumb at his opinionated and irascrible best – or worst if you choose – but they underline his courage and his fierce desire for what he would have called human betterment. Put simply, he, and my grandfather too, wanted to do good. It took the police two weeks to prepare their charges. I had time for lectures in Nelson and Blenheim. But when I came back I was summonsed. There were two charges, both of seditious utterance. I appeared in the Christchurch Magistrates Court at the beginning of March. On the morning of my trial I dressed in my warmest clothes and stoutest shoes. Edie put half a dozen handkerchiefs and a pair of woollen gloves in my pockets and I chose a small volume of Emerson’s essays. I said goodbye to the children and told them they must work hard at school. Then I set out. Felicity came with me. Edie was not well enough. I had wished to defend myself, but when I showed my friends the statement I meant to read they were horrified. John Jepson and Andrew had hurried up from Thorpe. Even Andrew was horrified. They might have airy notions about love, but about the justice of courts they were realistic. What I needed was a smart lawyer. They made me retain John Willis. And John would not even let me on the stand. But all this sat in my pocket, unused. John Willis conducted my defence on technicalities. These were my seditious utterances. I pleaded not guilty. The prosecutor was a man called Malcolm. He was a matter-of-fact, a dry-as-dust sort of man, but I heard a detestation in his voice once or twice in the morning. We anti-war folk were looked on as worse than murderers. I leaned across to John Willis and told him the sergeant was not being strictly truthful. These words were not consecutive. They came from different parts of my talk, like the words in the charges. John nodded. He had seen it. And when he rose to question Sampson he began on that line. I saw very soon it made up the substance of our defence. I was unhappy at that. I persisted in thinking this trial was part of an argument and my job was to persuade. There was the box. I should be in it, delivering my message. John kept stolidly on, though he must have felt my disapproval pressing on his spine. In court he dropped his uncertainties, hid the dark side of his nature, and came out the honest legal tradesman. It was a good piece of acting. But I was too angry to admire him for it. At once a shout of “Bravo!” came from behind me (Scotch, of course) and a short burst of clapping, like a pattering of rain. The magistrate nodded sharply, and the orderly was on his feet, threatening to put the offenders out. John was cross. He looked sternly at Andrew. Then he put his question again. The Sergeant remembered my words, but the magistrate, still frowning down the court, seemed to make no note of them. John glared at Andrew. But it all struck me as a piece of comedy; and Andrew’s cry as a good honest response. Sooner that than the legal splitting of hairs. John went on for a while; he produced qualifying remarks; had Sampson remember some; and sat down at last well pleased with himself. Malcolm called the second policeman, Wood. He was not a shorthand writer either. He had less control of himself than Sampson and spent his time on the stand glaring at me in a cold and weighty manner I found upsetting. He was, I should guess, a good hater. Wood gave nothing to John. He admitted taking down only the words he thought seditious, but declared roundly that my other words had not altered their meaning. He had no memory of “God save the people”. John made one good point. He asked Wood if he did not think it strange that he and Sampson had noted the same words. Wood made no reply, and John left it at that. Then, as Malcolm closed his case, he stood up again to defend me. He called no witnesses, but addressed the court. He did so in a stodgy manner. Eloquence would not have been acceptable to the robed individual on the bench; a man loose-lipped, dewlapped like a bulldog, and suffering a red collapse of his lower eyelids. His voice was like the creaking of a door. Appropriate, I thought, to the kind of justice that locked free speech away. John began by admitting that the words in the information would be seditious if used consecutively. But, he said, they were not so used. The policeman had admitted it. And he submitted to the court that he had shown beyond any doubt—beyond the shadow of a doubt, he said—that they had taken their notes haphazardly and ignored the qualifying phrases I had used. John was encouraged by this. He droned on like a great black bee, but it was plain to me he was trapped in the bottle of his legalistic mind. How I longed to jump to my feet and tell him and Malcolm and the magistrate what this case was all about. Words, words. A point here, a point there. “It is manifestly impossible for anyone to take down in longhand any sentence such as the one submitted by Mr Sampson. That contains fifty words and would have been uttered in less than twenty-five seconds.” The magistrate scratched with his pen. Sampson folded his hands. Somebody coughed in the body of the court. I looked round and Felicity smiled at me. Dan Peabody sat beside her. I had not known he was coming up. He nodded at the clerk. And so we went through the solemn farce again. John enlivened it a little by reading a sentence from the charge to Sampson and having him write it down. Sampson did it perfectly. “Yes,” John said, “well you probably know it by heart.” And he read two short paragraphs from a newspaper. Sampson got down only the opening words. 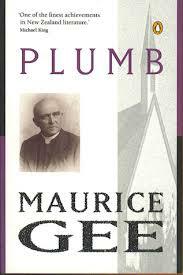 “Well, sir,” he explained, “what Mr Plumb said impressed itself more forcibly on my mind.” I was pleased to hear it. “George, be still, be still.” And on my other side the court orderly restrained me too. So I let Bradley get on with it. Felicity cried, “You cannot do this. Shame!” Her clear light voice was the first sound in the room as the door closed behind waddling Bradley. There was pain as well as anger in her cry. This was the point at which games stopped for her. Like Dan in Lyttleton jail, she looked into the dark. We had been until then, she and I, engaged in crusading. White chargers, gleaming swords, cannot have been far from her mind. Now she knew the truth. I leaned over the rail and held her hand. She kissed me and burst into tears. I asked Dan to take her home to Edie. He put his arms about her and led her away. Then I was taken out and put in a van, and delivered to Lyttleton jail. © Maurice Gee 1979, published in Plumb, Penguin Books.